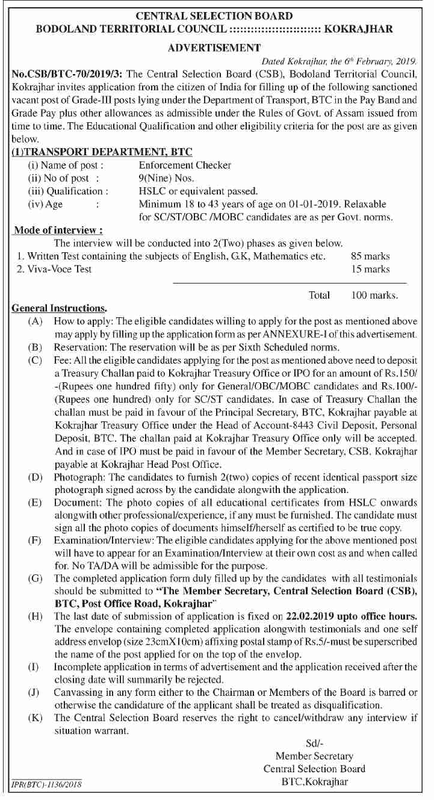 The Central Selection Board (CSB), Bodoland Territorial Council, Kokrajhar invites application from the citizen of India for filling up of the following sanctioned vacant post of Grade-III posts lying under the Department of Transport, BTC in the Pay Band and Grade Pay plus other allowances as admissible under the Rules of Govt. of Assam issued from time to time. No of posts: 9 (Nine) Nos. Educational Qualification: HSLC or equivalent passed. Age: Age Minimum 18 to 43 years of age on 01-01-2019. Relaxable for SC/ST/OBC /MOBC candidates are as per Govt. norms. Mode of interview: The interview will be conducted into 2(Two) phases as given below. Reservation: The reservation will be as per Sixth Scheduled norms. Application Fee: All the eligible candidates applying for the post as mentioned above need to deposit a Treasury Challan paid to Kokrajhar Treasury Office or IPO for an amount of Rs.150/ -(Rupees one hundred fifty) only for General/OBC/MOBC candidates and Rs.100/- (Rupees one hundred) only for SC/ST candidates. In case of Treasury Challan the challan must be paid in favour of the Principal Secretary, BTC, Kokrajhar payable at Kolaajhar Treasury Office under the Head of Account-8443 Civil Deposit, Personal Deposit, BTC. The challan paid at Kokrajhar Treasury Office only will be accepted. And in case of [PO must be paid in favour of the Member Secretary. CSB, Kokrajhar payable at Kokrajhar Head Post Office. How to apply: The eligible candidates willing to apply for the post as mentioned above may apply by filling up the application form as per ANNEXURE-1 of this advertisement. The completed application form duly filled up by the candidates with all testimonials should be submitted to "The Member Secretary, Central Selection Board (CSB), BTC, Post Office Road, Kokrajbar". The last date of submission of application is fixed on 22.02.2019 upto office hours. The envelope containing completed application along with testimonials and one self address envelop (size 23cmX 10 cm) affixing postal stamp of Rs.5/-must be superscribed the name of the post applied for on the top of the envelop.